Widower Sultan Singh lives a poor lifestyle in a village in central India along with his son, Karma and daughter, Devi. The region of about 50 villages is being terrorized by a bandit named Ranga and there are only 50 Policemen, who are unable to apprehend him. After Sultan's death Karma decides to teach the villagers to defend themselves but is typecast as a rebel, arrested by the Police, and held in a cell. Ranga abducts a young lad, names him Ranga, and trains him to be a bandit. After Ranga passes away, the younger Ranga, mesmerized by the evil Ginnibai, takes over. Ranga abducts Devi, forces her to marry him to sire children who he will train to become Rangas of the future, as well as look after several abducted young children who he also plans to train and turn them also into future Rangas - and there is no mortal on Earth who can stop him.Widower Sultan Singh lives a poor lifestyle in a village in central India along with his son, Karma and daughter, Devi. The region of about 50 villages is being terrorized by a bandit named Ranga and there are only 50 Policemen, who are unable to apprehend him. 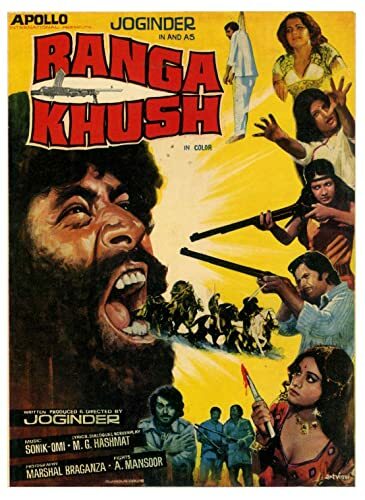 After Sultan's death Karma decides to teach the villagers to defend themselves but is typecast as a rebel, arrested by the Police, and held in a cell. Ranga abducts a young lad, names him Ranga, and trains him to be a bandit. After Ranga passes away, the younger Ranga, mesmerized by the evil Ginnibai, takes over. Ranga abducts Devi, forces her to marry him to sire children who he will train to become Rangas of the future, as well as look after several abducted young children who he also plans to train and turn them also into future Rangas - and there is no mortal on Earth who can stop him.